to the Farm in the 1890's and began testing. His groundbreaking and very methodical work brought into the peony world a new range of colours and much earlier bloom times than were available in the more common garden varieties of the day. 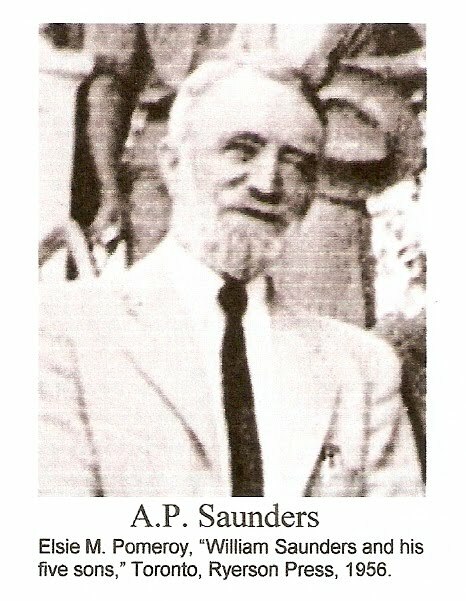 A. P. Saunders was born in London Ontario and moved to Hamilton College in Clinton, New York to teach. Although this is where he did most of his peony breeding, he spent summers at the Farm and would work here with his father and his famous brother Charles (the one who developed Marquis wheat) on plant breeding techniques. In 1998, the complete collection of all peonies at the Farm was down to around 220 plants. All were lifted, cleaned and divided by Agriculture and Agri-Foods Canada in 2000. Major restoration work on the peony beds in the Ornamental Gardens has been completed. Some gaps remain to be filled and duplicates removed. I imagine we are all familiar with the old bromide about dogs and their owners, and I wonder if it can also be said that plants and their experts eventually grow to resemble each other? After meeting Mary Pratte, peony expert, I’m prepared to make the case. Whoever has seen the peony – a quintessential sign of summer’s arrival in our town – gracing gardens with its sunny, bright, open flower faces, will recognize Mary. There is also the question of determination and perseverance. Peonies don’t give up easily and neither does Mary. She has used these qualities to transform numerous peony collections, including the wonderful collection at the Central Experimental Farm. Mary first drew breath in 1955 in Cincinnati, Ohio, and because her parents were Canadian was able to claim dual citizenship. Her father’s job with Procter and Gamble took the family to the Philippines, Switzerland and England, but despite living throughout the world, the family retained strong ties with Canada – particularly Southwestern Ontario – where they vacationed annually at a cottage on Lake Huron. Mary’s schooling took her eventually to the University of Western Ontario. She subsequently became an elementary school teacher, married and had a son, now 25. And, as far as the Friends of the Farm and peony fanciers are concerned, that might have been the end of the story but for two things. First, the years in England as a child set the seeds for Mary’s passion for peonies. To this day, she retains vivid memories of the peonies in the gardens where she played and of the beauty and scent of the cut flowers her mother brought into the house. 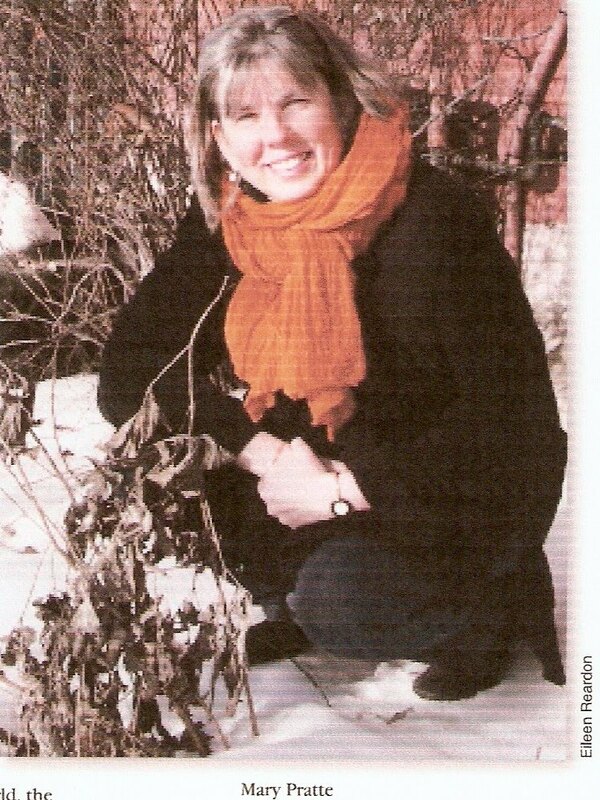 Second, after teaching for 10 years, and now living in Ottawa, Mary’s love of plants was blossoming. In the early 1990s, she followed her heart and took a two year sabbatical to attend the horticultural program at Algonquin College, obtaining a certificate in horticulture. Her interest and immersion in horticulture took her to garden clubs that often sponsored lectures on various topics. One in particular caught Mary’s fancy and prompted a modest outlay of $5 to become a member of the Canadian Peony Society. Unlike the peony she resembles in other respects, Mary has a humble side and downplays the attributes that took her from ordinary Society member to vicepresident to president. However, given Mary’s significant achievements in the peony world, I think we must admire her humility while acknowledging not only her expertise and contributions but also her enthusiasm and leadership ability. undertook the daunting and ongoing task of revitalizing the collection and bringing it up to a standard befitting its location in a national historic place. She continues to be the Friends’ peony advisor. In addition to advising on the Farm’s peony collection, Mary has taken her expertise farther afield, from her own personal collection, which now numbers nearly 150 plants, to helping to restore the collection at Les Jardins de Métis/The Reford Gardens in the Gaspé, to organizing two of the Canadian Peony Society’s annual shows at Rideau Hall. combines travel and horticulture to visit other gardens of interest. Perhaps the best way for a plant expert to resemble his or her favourite plant is to share a name and, yes, there is a ‘Mary Pratte’ peony, a loving tribute from her family. HYBRID INTERSECTIONAL (ITOH HYBRIDS) These are crosses between herbaceous peonies and tree peonies. They grow like herbaceous peonies, dying to ground each fall. P. tenuifolia (fernleaf), single, clear crimson, very very early, 15" Opened despite the heavy, gusting winds up to 72kph and temperatures 5 degrees below our normal of 15 (10 with windchill felt like 6). Species "Mollis", soft pink single has beautiful blue-green foliage, 20", Early. The first bloom for 2010. A beautiful peony that never disappoints. It consistently blooms from late April to early May every year with no problems. Old-fashioned garden peonies have Paeonia lactiflora as one or both parents. This species is the latest to bloom of 33 known wild peonies. The “Early Hybrids” are quite different, however, as they were bred using some of the earlier blooming wild stock, and as such burst into flower in late May or early June. It is worth looking for these early beauties so that you can extend peony blooming time in your garden as well as create unique and unexpected delights when you plant them close to or in the same area as your lilacs. The Friends’ Peony Team offers a free tour of the collection on June 19 (see Page 4). For more information on the collection, visit the website at www.friendsofthefarm.ca/peonies.htm. 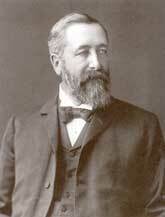 When William Saunders became the first director of the Central Experimental Farm (CEF) in the late 1880s, one of his mandates was to trial plants for their suitability to our northern climate. He achieved this goal, and considerably more. Fortunately, William Saunders was also a true Renaissance man with an insatiable curiosity about and interest in all that surrounded him. His love of ornamental plants led to the establishment of the fabulous plant collections at the Farm. Amongst them was a fairly small but select collection of fine peonies, including some less hardy tree and species peonies. Records indicate that only one of the species peonies survived over the years, and the original tree peonies are nowhere to be found. Despite plans that the collection remain small, over the years many of those in charge obviously could not resist trying some of the new peonies coming onto the market. The collection was expanded several times over the years and there are now more than 500 peonies – representing approximately 400 different cultivars – in the beds of the Ornamental Gardens. peonies at the Farm. When spring arrived, about 70 plants failed to emerge from the wet soil and another 30 or so were on their last legs. George Vorauer, former Director of Activities for the Friends of the Farm, and I approached AAFC with concerns about the imminent loss of the peony holdings, and were much encouraged when they decided to move the plants away from the salt-covered road, provide new soil after so many years, and produced a delightful design that would house them around the oak tree near the traffic triangle. Every plant was lifted, divided, treated and replanted that fall. We have not looked back since. answering questions and educating the public about the history of the collection. Many of the volunteers have also provided invaluable assistance at the Canadian Peony Society shows across the country. 4) plants bred by A.P. Saunders, one of William’s sons. Root purchases by AAFC and a generous donation from George Vorauer’s widow have helped us expand and ameliorate the peony beds over the past 10 years, and we hope to continue to improve this spectacular collection in the future, as it rivals or outshines any I have seen elsewhere. We are especially proud of the Saunders’ peony collection. In the ’30s and ’40s, A.P. Saunders became one of the world’s top peony breeders. He was not the first, but certainly the most prolific, breeder of early peony hybrids, many of them sporting new and exciting colours never before seen in this plant. the majority of his beautiful hybrids emerging when the lilacs are still in bloom near the end of May and into early June. He also produced unheard of colours such as lavender, cherry and creamy yellows, as well as two-toned flowers edged or with flares at the base of the petals in different, and often deeper, shades – a real feast for the eyes and showstoppers to this day when planted in both public and private gardens. Vi Simkins dug her wedding dress out of the closet, tried it on for size, and posed for a photograph -- all for a laugh. Some 60 years later, it still fits, much to the delight of her husband John Simkins, Oakville's well-known gardening writer and peony expert. "It's been 60 happy years," says Vi, a slim, well-dressed 87-year-old. "Very happy," adds her equally slender, 88-year-old husband who may still fit into his old army uniform. 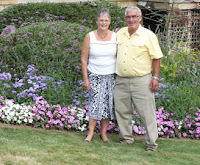 It seems gardening has kept this couple physically fit, healthy and happy. They have more than 700 flowering plants - 75 of them peonies - at their home that backs onto Morrison Creek. About 600 feet of green space lies between their property and the creek. He starts plants from seeds in his basement and in a small greenhouse he has built at the back of the house. At one time, he kept bees. The former Violet Daisy Jane Medway married John Simkins on July 27, 1946, a month after immigrating to Canada from England. "I came here with nothing...I had no clothes. I bought that (wedding) dress at Eaton's for $5.95." Sixty years later, she still cherishes it - along with the happy memories. The romance was whirlwind. 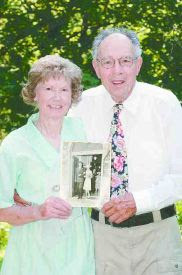 They met at a private reception in England in November 1945 and by Christmas "we decided to get married," said Vi. During the war, she was a fireguard, part of a five-member team who kept a night watch for bombs penetrating wooden rooftops and dousing fires using a pump, bucket and hose "because the fire brigade couldn't get to all of them. I was the one who crawled out face down with the hose to get at the fires." She also volunteered as a farm worker, "weeding onion fields. We had nothing to eat...we were hungry, we were all hungry." Everything - food and clothing - was rationed in wartime England. "I remember we would get one egg of a month, and maybe two ounces of cheese each per month." Vi learned upon leaving that there was only enough food in the country for six weeks. "You needed coupons to buy clothes - that's why I had no clothes when I came here," she continued. "I was a teenager when the war broke out. You can image how tough rationing was on teenagers. "The war started in England in 1938 and we were at war for seven years by the time I left. There were nightly bombing raids towards the end of the war." It was an eerie sound Vi will never forget. "John went home to Canada in February aboard the ocean liner Aquitania, and we made sure that getting married was what we wanted to do. He had to get me a permit to leave but I had to arrange my own transit, and each time I called I was told, 'you can go tomorrow' and I would say, 'that's too soon, I'm not ready,' but I finally got booked. There were only last-minute seats available on planes that flew to Canada. I called on a Saturday and I was asked, 'Can you go tomorrow?' and I said 'yes.'" She arrived here on June 25, 1946. "It was love at first sight," said John. They were married in Hamilton. Born in England, John came to Hamilton with his family when he was three months old. He was a soprano in his church choir. "I was raised by my aunt after my mom died when I was young. "My father moved to Oshawa and later went back to England after my mother died, taking with him my twin brother and my younger brother." "My aunt in Hamilton took me in. She was a wonderful woman. I became part of her family." Attending Delta Collegiate in Hamilton during the 1930s, he excelled in high school football, water polo and basketball - and got involved with school theatrical productions as part of the stage crew. He was at McMaster University studying chemistry and physics when the Second World War broke out. He joined the army in 1942 at the Toronto depot. He trained in Newmarket, was an officer-cadet at the Stanley Barracks in Toronto, was sent to Victoria, British Columbia for an officer's training course and became 2nd lieutenant before going to Brandon, Manitoba for artillery training and to Halifax, Nova Scotia for anti-aircraft training. He went overseas to England aboard the Queen Mary and joined the Royal Hamilton Light Infantry (RHLI), moving up through the ranks to Major. Wounded in Germany in March 1945, he was flown back to England and was discharged from hospital before the war ended. "I was on leave when the war ended and taking a general course at a London university. To get in, you needed a year at a Canadian university. I was in third year at McMaster when the war broke out." "The army paid for my education," said John. "It was part of my discharge. I had a choice between a farm or going back to university." Upon graduation, he landed a job with Shell Oil and stayed with the militia until recently as a commissioner. "The employers were lined up at the door waiting to hire graduates," said John. "A friend told me that Shell Oil was a good company to work for, so I went with them." He never looked back. John stayed with Shell for 34 years, accepting 'the golden handshake' three months before Shell's Oakville refinery shut down in 1983. 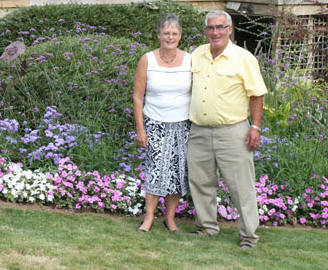 After retiring, he worked part-time at Sheridan Nurseries for a while as a garden advisor. The Simkins moved to Oakville permanently in 1961 - they still live in the same house they purchased 45 years ago. "When I first started with Shell Oil, we moved back and forth between Montreal and Oakville," said John. "Three months after John retired the refinery shut down," said Vi. "I retired instead of transferring to Calgary," said John. "When they closed the Oakville refinery things worked out perfectly for us - I had accepted a golden handshake. It was a great place to work. We had a lot of fun." She was a stay-at-home mom raising three children, Janice, Jennifer and Jon, and today grandmother of three. She worked in the garden, sewed her own and her children's clothes and volunteered at Oakville Trafalgar Memorial Hospital - she worked on a quilt that raised $50,000 for OTMH. She received her 35-year pin this year. "I still volunteer one day a week." John also volunteered at the hospital providing horticulture therapy to senior patients and helped create a rooftop garden as a member of the Oakville Horticultural Society. John's passion for gardening literally grew out of a package of 'mystery seeds' he received as a gift. They didn't grow but others did. Once settled in Oakville, he decided to create a garden around his home, and took courses at the Royal Botanical Gardens (RBG) and became a qualified judge of horticulture. Advised by the RBG's Dr. Leslie Laking after whom its Laking Garden is named, John decided to specialize in propagating and hybridizing tree peonies. He joined the American Peony Society and a few years later became its president - and the garden filled with peonies. John also joined the Oakville Horticultural Society about 45 years ago, served as president twice and also as a district director of the Ontario Horticultural Association in charge of 23 societies between Oakville and Port Dover. 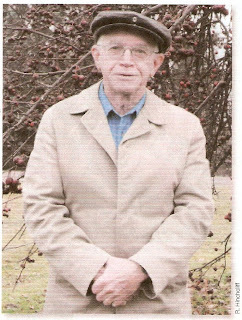 About a decade ago, he received the association's Silver Medal in recognition of his contributions to horticulture and his Master Gardener's 20-year pin. He took Master Gardening courses at the University of Guelph. "At the time my oldest daughter Janice wanted some extra pocket money and got a part-time job writing the local high school news for the former Oakville Journal Record (OJR) detailing events at Oakville's three high schools earning $3 a week," said John, who was at the time rapidly becoming known for his gardening expertise. "After a couple of weeks she told the editor that, 'Your paper needs a gardening column. My father will write one for you.'" Thus began John's more than 40 years of writing a weekly column, In Your Garden, that continued in The Oakville Beaver after the OJR closed during the early 1980s. He retired from writing earlier this year. John also wrote for gardening magazines, joined the American Garden Writers Association, and lectured annually on 10 different topics - mostly about peonies - to various gardening organizations. The Simkins' garden became a local showcase, and he sold seedlings planted in plastic cups for $1 as a means to encourage others to take up gardening. "Now he's retired from everything," said Vi. "Everything we joined John ended up being a director or president. He had a lot of things going." Having settled in Oakville, the couple joined St. Jude's Anglican Church. He taught Sunday School for 34 years, served as a People's Warden, was a lay reader and fundraiser, was instrumental in the designing and planting of its memorial garden - he helped form its garden guild - and was also a bellringer. He and Vi were instrumental in bringing Dan Tregunno, one of Canada's top bellringers, to St. Jude's and reviving interest in traditional bellringing at the church. Their 60th wedding anniversary will be celebrated at the home of their daughter Jennifer in Burlington on Aug. 6. Bill Wegman remembers the exact moment that gave rise to his passion for peonies. It was in the mid-80s and while leafing through “one of those fancy catalogues from a mail order nursery” a heritage peony caught his eye. At that point in his life – married with three young children, and a communications engineer (civilian) with the Department of National Defence – Bill’s gardening pursuits were limited to growing vegetables – a holdover from watching his mother tend a vegetable garden on the family farm where he grew up in North Pelham, in the Niagara Peninsula. Although ‘Doris Cooper’ beckoned from the catalogue, Bill knew next to nothing about peonies. He just knew that he wanted Doris. So Doris was purchased, planted and nurtured. She became the centerpiece of Bill’s slowly expanding garden – a small collection of hand-me-down peonies. Canadian Peony Society, which was planning an exhibition in 2001 at the Governor General’s in Ottawa. By now, ‘Doris Cooper’ was a beauty – “at least in my eyes,” says Bill – so he entered her in the show. Bill was justifiably proud of his heritage peony – ‘Doris’ won best of the show. Bill now has two “bests of the show” to his credit, although he is quick to downplay the accomplishment. His own peony collection now numbers over 100 named cultivars as well as 150 three to four-year oldseedlings and several hundred younger seedlings. diverse, and I learned so much from George.” Bill proved a quick study and was invited to replace George when he retired in 2002. I have not grown peonies in other areas of the Atlantic provinces, only my own small section. However, I would suspect that it is typical. The plants perhaps flower a few days later in Newfoundland and northern New Brunswick, and a few days earlier around Yarmouth. Since flowering time usually varies a bit from one year to another it would be hard to be certain. The first peonies ever grown here would be paeonia officinalis rubra. One autumn day in the late seventies my great uncle stopped in to see me. He had been making himself a few square feet of flower garden, and in it had flowers that he remembered from his childhood, johnny jump ups and lords and ladies (pink and white mallow). He wanted to tell me of his latest triumph - he had gotten "a red piney plant just like Mama's!". Although I read that these are long lived and enduring plants they don't seem to be particularly so here. Neither my great uncle's nor my grandmother's plants survived the neglect that fell upon their gardens after their deaths and I have never seen one anyplace like an old garden or cemetery. They don't seem to be commonly grown here now, although I know of a few, and have a red and a pink myself. The one in my front garden comes into bloom around the first of June, the one in the back garden in mid June. On well established plants the flowers last 2-3 weeks. A lovely splash of colour, but a distinctly unrewarding scent! They are not difficult to grow, but are sprawly plants that go dormant early if in a dry place. The next peonies to arrive here would be the lactifloras. The first ones were undoubtedly French peonies, their descendants still to be seen everywhere, blooming the very last of June and early July. My uncle tells of going to church on Sunday in the horse and buggy when he was very young. He always watched for the corner with the hedges of peonies. They are long since gone, and so is even the house, - nothing but a hayfield there now. I believe that my grandmother grew every peony she could get, and kept what she regarded as the best of them. My uncle thinks the first of her peonies came from those hedges, and many of her peonies live in my gardens. Perhaps my Modest Guerin first lived there, and the one I think is Mons Dupont. They grow in many gardens here. The red semi double might have come from there also, they had mainly pinks and whites in the 1920's and 30's, and most of the reds were semi doubles. There was great excitement in my grandmother's garden in the 1930's when the big fully double red (Felix Crousse) flowered for the first time. My grandmother told me that her best white was Festiva Maxima, her best reds were Felix Crousse and Karl Rosenfield. I did finally identify the one my grandfather called her best pink. It was Albert Crousse - she was absolutely correct. You see these everywhere; they seem to do equally well in pampered gardens and on old lawns where the only attention given them is not mowing them off. They and even older peonies used to be glorious in ancient clumps planted by gravestones, but the present mowing off, of ornamental plants and bushes in cemeteries is not a subject that I have polite opinions on . I did rescue three of these from my relatives' graves. My grandmother had put her finest and best beloved peony (Festiva Maxima)on her mother's grave, it now blooms for her daughter, granddaughter, and great granddaughter. From what I read peonies bloom later here than in more southerly regions, and they certainly grow taller. My grandmother's central garden had beds with a spine of peonies planted down the middle of them; when I first made the biggest bed in my back garden I did the same thing. Sarah Bernhardt, La France, Albert Crousse, Karl Rosenfield, Festiva Maxima, Gramma's late pink. (Martha Bulloch?) Georgiana Shaylor and Modest Guerin. They were lovely, and bloomed well despite partial shade. Albert and Modest are the tallest, usually about 38-40 inches, sometimes more. But there was one obvious problem - Georgiana Shaylor. The fact that for me it takes 5 years to bloom as a full double, and even then does not always do so, is no deterrent. I prefer it as a semi double. But no one mentioned then that it was short! A good 10-12 inches shorter than all the others. When I planned the beds in the front garden I did more research. Into the back row went the taller plants like Albert Crousse, Sarah Bernhardt, Bowl of Beauty. For the front row I sent for short plants instead of just the old classics. In went Raspberry Sundae and Top Brass. This was no improvement. Sarah was no Sarah, but a short white which never grows higher than 22 inches. Raspberry Sundae and Top Brass do not grow here to 27 and 28 inches as their description said, but 33-35 inches. Which is why the only pink oriental poppy that grows well for me is down in behind 2 peonies! Raspberry Sundae never develops the red overlay that was so pretty in the picture, it's just another pale pink , and I do not care for the "honey scent" of Top Brass. Sometimes I think I should just grow my peonies in rows like carrots! I am so besotted with them that I would think they were perfectly gorgeous just like that. Some plants grow tall and leggy and reach badly towards the sun no matter how sunny a spot I put them in. I think perhaps they need a hotter climate. Primavera is like that, and although it flowers freely, the flowers are not impressive. My grandmother had it, but apparently did not keep it. Perhaps I shall not either. Solange is less generous with its bloom, but very beautiful. Our summers seem to be getting hotter and dryer lately. After the worst one yet the flowers on Solange were the loveliest it had ever produced. I hear that Madame de Vernville likes a cool climate, I should like to try it. The descriptions I read often mention that some flowers fade considerably in the sun. Officinalis rosea most certainly does to quite a degree, and some others do a bit. I suspect not as much as in hotter gardens. I like soft colours, so don't really mind when officinalis rosea and Coral Charm tone down a little. The old classics are usually available here, and occasionally something different. I grow a few hybrids, all from mail order. Salmon Chiffon has been an unusually lovely plant but so far rather delicate. It's only 3 years old, it may improve. The Wittmaniana hybrids Avante Garde and Le Printemps are sturdier, blooming early in June. There is one tree peony in my garden - next year will tell if it will thrive or not. It's nice to have a bit of variety, but the best growers are generally the older lactifloras. They are the backbone of peony growing here, sturdy and reliable, surviving even disastrous years. To my grandmother's best reds I would add Red Charm. A lovely plant, even though it's lack of side buds shortens it's season. I grow for garden effect, not competition, so side buds mean my peonies usually last until about 20 July, unless it's an unusually hot year. I am sure that Festiva Maxima is one of the commonest peonies grown, and with good reason. Miss America is a wonderful white, as is Kelways Glorious, although probably less vigorous. The white that I think is Mons Dupont is more widely grown. In pinks the choice is exceedingly broad, even in old unnamed plants. Probably the pink one sees most often here is Edulis Superba, a good plant though no favourite of mine. Mrs. F. D. Roosevelt must be just as vigorous, as is Albert Crousse, which to me has the best flowers. But that's another subject! The Seager Wheeler Farm, just east of the town of Rosthern, Saskatchewan, is the newest location of a public peony planting in Saskatchewan. Seager Wheeler (1868-1961) was perhaps the most famous prairie farmer in his day. While best known for his international awards in wheat competitions, Seager Wheeler was also involved in horticulture. Emigrating from England in 1885, he became an innovator in farming methods and eventually published his own book on grain growing, in 1919. Among his horticutural achievements, he introduced to his region the Siberian silverleaf willow, the Saskatchewan Crabapple, Prolific and Ruby cherry-plum hybrids, Advance sandcherry and Gold Coin potato. His farm was well known for its beautiful gardens, and in particular was known for its delphiniums and annual poppies. To my knowledge, Seager Wheeler was not involved much with peonies, but his farm now includes a modest historical collection of peonies. The peonies have been donated by the Saskatchewan Horticultural Association and Hollingsworth Peonies of Maryville, Missouri. Because the site has been designated as a national historic site, it was felt appropriate that an historical collection of peonies could be grown in a couple of the rectangular beds, similar to the beds used by Seager Wheeler. The beds have been designed to hold 40 cultivars of peonies, planted in chronological order. The limited number of plants (one of each cultivar) emant that a number of very good cultivars could not be accommodated, and the choice was dictated somewhat by availability. The first planting (about 75%) were planted in the fall of 1997. While most of the peonies are growing, it appears according to my records, that some peonies were planted in the wrong locations, and thus some investigation will need to be done to verify the cultivars and possibly replant them in their proper chronological order. The peony collection is entriely herbaceous, as tree peonies require much more care to winter them successfully here. The collection begins with the cultivar 'Edulis Superba' (1824), and is followed by the well-known 'Festiva Maxima' (1851) and the now very rare Delachei (Emperor of Russia)(1856). 'Duchesse de Nemours (1856) and Augustin d'Hour (General MacMahon)(1865/67) are next in line. Seven more represent the 19th Century. The first bed is completed with 8 more cultivars from teh time period 1901 to 1918, and includes the widely known 'La France', 'Sarah Bernhardt', 'Karl Rosenfield' and 'Kelway's Florious'. These are all cultivars, which would have been available in seager Wheeler's time. A second bed was included to bring the collection more up to date. Here, it was very difficult to select only 20 cultivars. 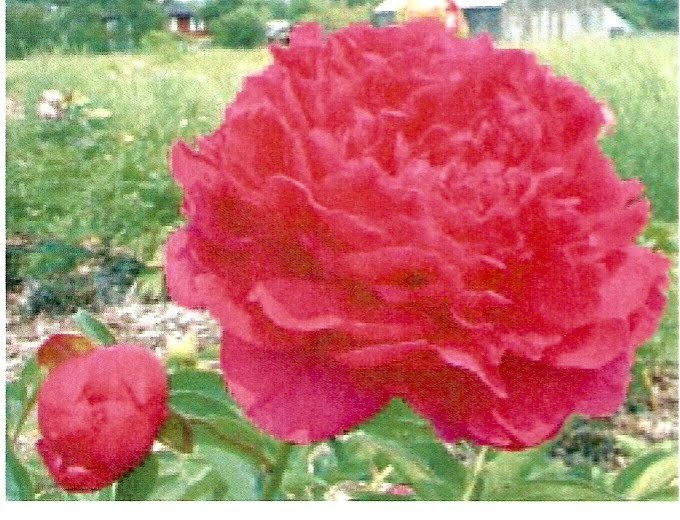 The emphasis on Chinese peonies of double form was continued, although af ew hybrids such as 'Red Charm', 'Firebelle', and 'Pink Hawaiian Coral' have been included. Most notably, the Itoh Hybrid 'Garden Treasure', from Hollingsworth Peonies, was included, and it has survived its first winter. Another Hollingsworth donation, 'Sweet Melody' concludes the collection with its representative from 1992. Recently I was informed that three plants have been seriously damaged by what appears to be botrytis blight. It is hoped that these will survive. This fall, it is hoped to add a few more cultivars to the collection. One is 'La Perle', a rather elusive Crousse introduction from 1886. It will be a few years before the collection will be in good bloom, but, we are hoping that it will become in time a notable tourist attraction to the Seager Wheeler Farm. In the meantime, visitors are welcome to the farm from Victoria Day Weekend to Labor Day, and can view the historic buildings, gift shop and teahouse, orchard, and English garden. The farm is located just of Hwy 312, approx. 8km east of Rosthern. From Saskatoon it is about 68km NE. The Devonian Botanic Garden (DBG) in Devon, Alberta (near Edmonton) has a sizeable collection of herbaceous and species peonies, most of which were donated by Cyril M. Clarke in the late 1940s. This collection includes a number of now-rare cultivars, and provides us with a fascinating glimpse into the history of peony cultivation in Alberta. Cyril M. Clarke was born in 1882 in St. Lucia, British West Indies, the son of an Anglican minister and his West Indian wife. He was educated at Harvard and Cambridge, served in World War I with the British army, then emigrated to Canada. In 1920 he established his homestead at Teepee Creek, a hamlet 35 miles NE of Grande Prairie (250 miles NW of Edmonton). As a black, highly educated, lifelong bachelor, he must have puzzled his neighbors, who described him as an eccentric recluse and dismissed his farming abilities. After a severe dust allergy forced him to lease most of his farm in 1923, Clarke became a passionate collector of peonies who spent as much as he could spare on new cultivars. He’s said to have known the plants by sight, and had a scholarly grasp of each cultivar’s origin and characteristics. Clarke carefully authenticated the identity of the cultivars in his collection, where possible purchasing them directly from the breeder, and kept meticulous records of the dates and sources of all new acquisitions and their performance. Furthermore, Teepee Creek sits in a Chinook belt near the zone 2a/1b border, which he recognized was ideally situated for cold-hardiness trials. It’s estimated conservatively that Clarke tested about 2000 cultivars over his thirty years of collecting; as a result, he became a regular contributor to the American Peony Society’s Bulletin and was consulted by many of the leading hybridizers of the day. As he got older, Clarke developed a severe allergy to peonies, and cataracts caused his eyesight to deteriorate. Despite this he continued to care for his peonies himself, on his hands and knees, wearing long sleeves and a handkerchief over his face. In the fall of 1947, the 43 best-performing cultivars from Clarke’s collection were planted in a long display bed at the Agriculture Canada Beaverlodge Research Station (BRS), to accompany the landscaping of the Station’s first office building. Nearly sixty years later, these plants still bloom magnificently from the last week of June until mid-July. They were originally planted in short rows of three plants per variety, in the layout used for early APS trials, and have not been moved. However, over time some rows became mixed, as divisions from vigorous plants in both this bed and the BRS’ trial beds (maintained from 1922-1965) were used to fill gaps. No records were kept of these alterations to the planting plan, complicating attempts by BRS staff to positively identify the cultivars. Simultaneously, Clarke arranged the donation of the majority of his collection to the University of Alberta, in part from his hospital bed. His deteriorating eyesight during this period is heartbreakingly apparent in his handwriting in the correspondence, and many of the plants had to be dug and shipped with the assistance of friends. Between 1948 and 1951, Clarke donated his records and 921 specimens consisting of 331 named varieties, 3 species, and 14 hybrids to the Department of Horticulture. This collection included all of the proven cultivars planted at the BRS, as well as other cultivars considered highly desirable by pre-WWII plantsmen, and many cultivars that were being tested for hardiness prior to their general introduction to the gardening public. Canadian-bred cultivars in the collection included James W. Keagey’s ‘Dieppe’, ‘Dunkirk’, ‘Falaise’, ‘Margaret Logie’, ‘Nosegay’, ‘Premier Yoshida’, ‘Rose Bowl’, ‘White Bomber’, and ‘White Cockade’; William Brown’s unnamed seedling #666, ‘Donna Jean’, and ‘Fairleigh’; Dr. F.G. Brethour’s ‘Blanche Elie’; and Evelyn Lossing’s ‘Louise Lossing’. Clarke’s correspondence with the U. of A. indicates that the Department of Horticulture intended to continue collecting new sorts and to evaluate and report the performance of the cultivars in the collection to the APS. The collection was initially planted to the north of McKenzie Hall, in 6 formal beds near the old greenhouse and tennis courts, and marked with a commemorative bronze plaque. Sadly, Clarke passed away before the plants could bloom and their identification be verified by him. As the University grew, the herbaceous peony collection was moved to a new location beside Kelsey Hall. The plants were also regularly used as landscaping material by the Grounds department. No records have been found to date of the changes made during this period. In 1965, some divisions of the original plants were supplied to the university’s newly established Botanic Garden near Devon (zone 2a). The rest of the collection was moved at a later date from campus to its current location, in broad island beds of very sandy soil at the northern end of the garden. During these moves, some plants were lost and some labels misplaced, and reidentification was complicated by the inadequacy of early descriptions to differentiate similar varieties. Finally, a number of labels were accidentally lost during weeding in the 1980s. For want of peony expertise on the DBG’s staff, care of the herbaceous peony collection since the 1970s has been limited to routine maintenance. Only a handful of newer cultivars have been added, either as donations from local growers or acquisitions during the establishment of the Kurimoto Japanese Garden. A separate species peony collection (which I’ll describe in a future article) has fared rather better, thanks to continued acquisitions and research done by DBG staff. The Clarke collection is of special interest to peony fanciers, both for historic reasons and on the merit of the plants themselves, which are both very hardy and increasingly rare in home gardens. The Alberta chapter of the CPS has proposed a long-term partnership with the DBG. Our goals will be to preserve the collection and improve the care of the plants, identify unlabelled plants where possible, reintroduce ‘lost’ cultivars from the original Clarke collection, broaden the collection to include recent cultivars, and eventually replant the collection in a design more suitable for easy viewing and year-round interest. In turn, the DBG has offered us meeting space and the opportunity for members interested in hybridization to use plants in the collection as breeding stock. “History, Management, and Recommended Varieties of Peonies in the Peace River Region”, John G.N. Davidson, 1991. Agriculture Canada Northern Research Group Bulletin (NRG 90-09b). "Cyril M. Clarke, Widely Known Canadian Horticulturist, Dies At Home" (obituary), George W. Peyton, American Peony Society Bulletin, no. 127, Dec 1952. Collected correspondence of Cyril M. Clarke with R. J. Hilton and R. H. Knowles, University of Alberta Department of Horticulture, 1947-1951. Devonian Botanic Garden archives. 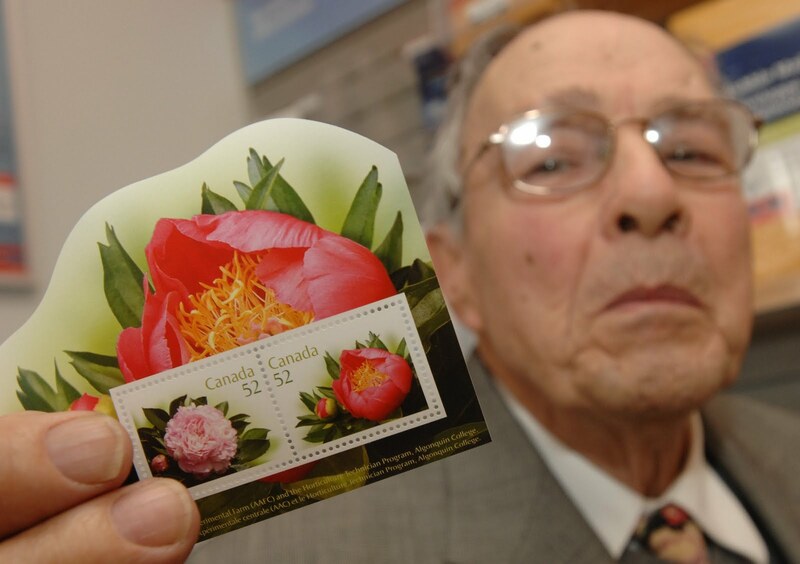 Oakville resident John Simkins gives his stamp of approval to the release of two Canada Post stamps dedicated to peonies. Simkins is a well-known gardening expert and founder of the Canadian Peony Society. Helping him hold a plaque commemorating the stamps is Sheila Black of Canada Post. Release of the newest floral-themed stamp (two peony hybrids). Oakville was selected as the stamp cancel's* origin due to the city's history with the Canadian Peony Society. To mark the occasion, Canada Post hosted a Customer Appreciation Day. 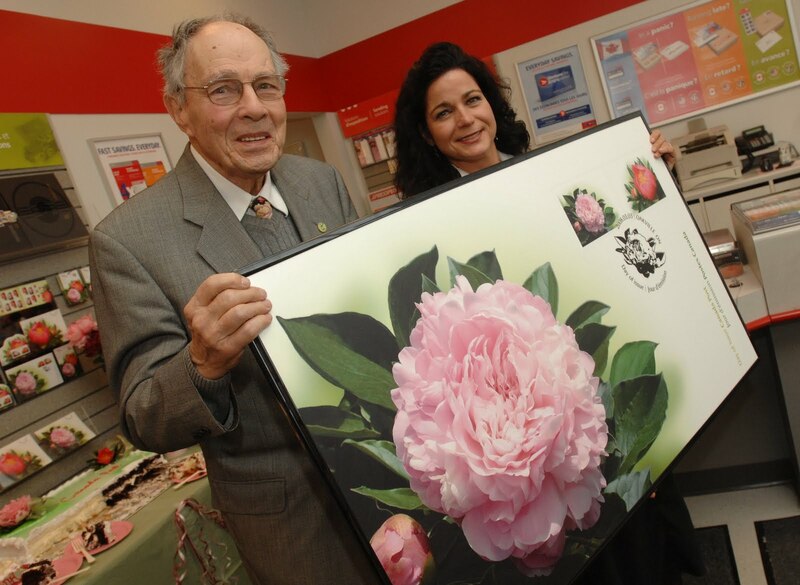 Mr. John Simkins, 39-year Oakville resident Founder of the Canadian Peony Society (Peony subject matter expert)holds up the new stamps with Sheila Black, Canada Post. Two of Canada's most popular flowers are featured in new stamps for 2008. 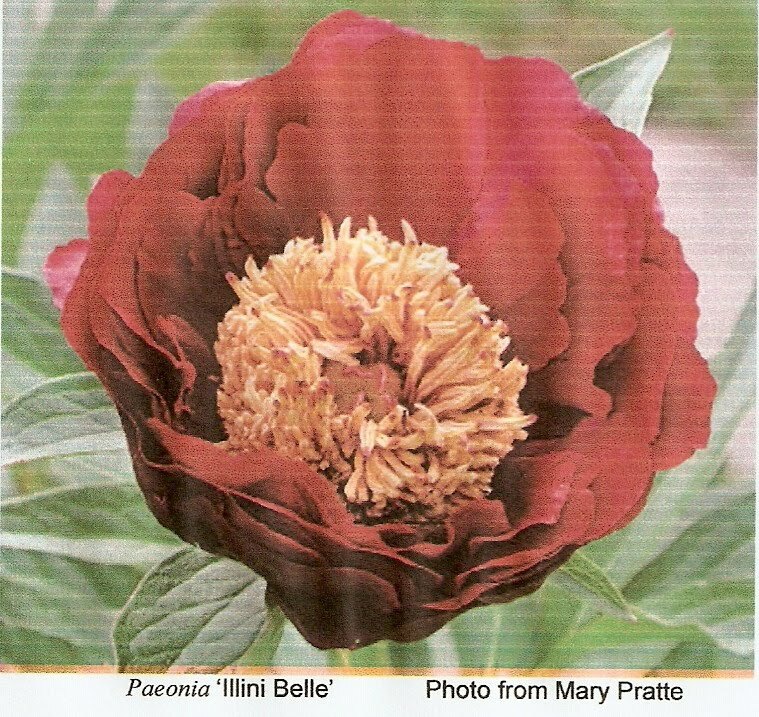 On March 3, Canada Post will issue two stamps dedicated to peonies (Paeonia lactiflora). The stamps capture two Canadian hybrids in all their blooming glory: the 'Elgin' and the 'Coral n Gold'. The 'Coral n Gold' hybrid was named for the appealing colour combination of its blossoms. Bred by Lyman Cousins in London, Ontario, the 'Coral n Gold' features a cup of bright petals surrounding golden stamens. To photograph appropriate specimens, Isabelle Toussaint, a freelance designer in Montreal, travelled to Ottawa and visited greenhouses at the Central Experimental Farm and Algonquin College. In the design, Toussaint created a soft, neutral background and used close-cut and shadowing techniques to emphasize the blooms and foliage. "I love to work in my garden, although I'm by no means an expert," says Toussaint. "The challenge was to create a stamp that mimics the impact that peonies have - when they flower, they make a bold statement." The peony stamps continue Canada Post's informal tradition of issuing floral-themed stamps in the spring. Previous stamps have featured daffodils, lilacs and gardens. The spring issues have proven popular not only with collectors, but also with people sending out invitations to weddings and parties. The domestic rate (52¢) stamps will be sold in booklets of ten; official first day covers and souvenir sheets will also be available. Note the number of stamps printed: 12 million stamp booklets, and 275,000 Souvenir sheets of 2 stamps. Canada Post gave members of the CPS complementary copies of an Official First Day Cover. A fitting souvenir which celebrates the launch of two peony stamps. We are pleased to pass on this collector's item to all current members of the CPS. Mr Milton Jack bought property from Wm McEwen and Tom Catherwood, and launched Ferncliff Gardens at Hatzic in 1920. There, he hybridized and developed new forms of gladioli and other flowers, which were shipped to customers throughout North America, and sent to major shows and competitions. Where blooms were entered for competition, over fifty first prizes were won, the great majority of these being won by Mr. Jack's own originations; many of his varieties are successfully grown as grand champions in international shows. On September 18, 1947 the Fraser Valley Record ran a story in which Mr. Milton Jack explained how the Bulb Industry had developed. The paper reports that Mr. Jack had recently returned from visiting a number of the major gladiolus shows in the Pacific North West area where he displayed his own originations. In 1953 Mr. Jack was awarded a Bronze Plaque for his conspicuous contribution to advancement of gladiolus from the North American Gladiolus Council.1 Mr. Jack was selected for the award because of his contributions during the past 30 years in hybridizing and developing new varieties of gladiolus. The award was presented for the first time to anyone living in the Pacific Northwest. In the forties and fifties the private gardens and the Jack family home was the scene of the annual "Strawberry Social" tea of the Hatzic United Church. The Jack family continues to operate a retail nursery growing high quality dahlias, iris, daylilies and peonies. Linda K Jack - 1970 - Double, large, deep, rose-red, highly fragrant, late. Good stems and strong growth. Not offered by Ferncliff since 1992.
of peonies from Holland, and was unable to identify it, so gave it the present name. strong stems, but may need support. Blooms late midseason. Good fragrance for red cultivar. Reverend Milton Jack was born in Chateauguary, Quebec and educated at McGill and Chicago universities. He entered the Canadian Presbyterian Mission in 1905. He was principal of the Theological Training School in Formosa and later joined the faculty of the University of Seoul, Korea. He also did missionary work on Formosa and the Chinese mainland, where he contracted malaria. After a lifetime of recognition, Mr. Jack passed away at his home on December 5th ca 1964 at the age of 88. He was survived by his wife Catherine Winifred Jack; two sons, Lawrence and Wilfred (operated business along with his father); two daughters, Miss Elsie Jack and Mrs. Gilmour (Marjory) Clark and eight grandchildren. Pallbearers were Ross Clark of Vancouver, Robert Jack, David Jack, Colin Jack, Jack Peetoom and Al Pethybridge. David Jack - grandson; continues to operate Ferncliff Gardens with his wife Sheila. In 2008, they were awarded a special recognition by the Mission Community Heritage Commission for continued operation of the pioneer family business. David, the dahlia expert, has been growing dahlias for over 40 years. David graduated from the University of Guelph with an Ontario Diploma in Horticulture (O.D.H.). The Jack home, built in 1922 is two stories, Tudor style white stucco with brown trim, at least 6 small windows on the second story, 2 larger windows on the first story. The interior includes spacious well-maintained rooms, which provide a gracious setting for many gatherings and special events. Rural farmland features fields of flowers. The owner's personal gardens comprise about 3/4 acre. Daughter Elsie Jack remembers that the private flower garden at Ferncliff became very lovely over the years. A spacious terraced lawn over looks the valley. To the north a wide border of trees and Azaleas. A border of low growing Juniper marked the boundary where the hill sloped steeply down in front of the Juniper, Azaleas, Dwarf Shrubs and Perennials. On the west side a pergola about sixty feet long covered by wisteria, and some other climbers along the way marked the end of the lawn. Below the Pergola on a slope was her father's hobby, a rock garden, full of unusual Alpine plants. Ferncliff Gardens is an internationally acclaimed "pioneer flower farm" located at 8502 McTaggart Street V2V 6S6 in Hatzic, just east of Mission. Pioneers in the horticultural mail order service and hybridizing of new varieties of flowers, the members of the Jack family have adapted their business over the past eighty-eight years, (1920 to present) making it the oldest family operated business in Mission. The property includes 10 acres of farmland and the private residence. 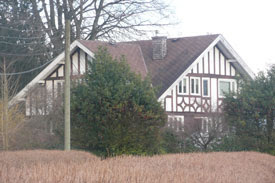 The house sits on the eastern end of the farmland overlooking the eastern Fraser Valley. 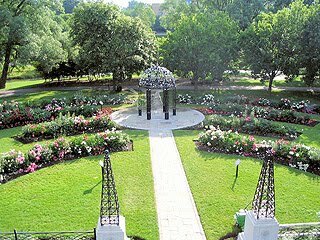 Rowancroft Gardens had its beginning in 1914 created by Miss Mary E. Blacklock. She had purchased 5 acres (2ha) of Lot 10, Con.3, WHS,(west of Toronto Airport in Mississauga. It was just South off the Malton Sideroad, now Derry Road, west of Hwy 10 on East side of Credit River) in October, 1913 for $1,500.00 from Francis Jackson and established a botanical garden. She lived in a two storey Georgian style home of wood siding construction. 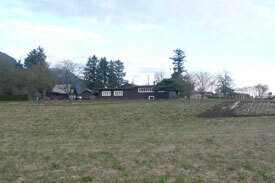 On April 10, 1918 she purchased another 2.4 acres (1ha) for $732.00 from Goldwin Smith. By 1920, business was booming so well she had 7 people in her employ, that were required for eight months of the year. She hired several others during the growing season. 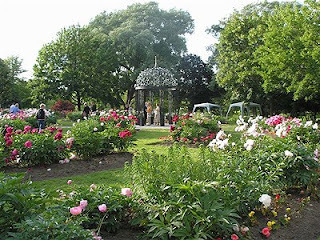 It was a favourite spot for people to stroll, especially in June when peonies were in full bloom. Miss Blacklock was born in Hastings, ON to John and Louise Blacklock. When she was a young lady, her family moved to Toronto, where her gardening expertise was nurtured and took root. She planted a garden at their Davenport Road home. She sold plants for 5 and 10 cents and 25 cents for shrubs and donated the money to St.Annes Anglican Church Building Fund. She started correspondence with horticulturalists and collected seeds from all over the world until she had an outstanding collection of flowers in her garden and tremendous knowledge. Upon her fathers passing in 1910, she started to travel to visit the horticulturalists she had been corresponding with. She visited the Kew Gardens in London, England the gardens of Frenchmen, near Tours, France. Here she found peonies, which became her passion. From Mons. V. Lemoine in France, she was introduced to lilacs she adored and would transport to Canada. In 1914, before the start of WWI, she established Rowancroft Gardens. Her french peonies and lilacs were much appreciated when she introduced them here. Seeds from this stock replenished their supply of lilacs, of which the fragrance was thoroughly enjoyed during the blooming season in the spring. She entered floral competitions at Horticultural Shows around the province. She took first prize at the Toronto Horticultural Show for her irises and a first at the London International Show for peonies. In 1915, Miss Minerva Swann Castle began to work with Miss Blacklock as a helper. She was tremendously horticulturally conscious and gardeners began to flock to Rowancroft Gardens to learn from her astonishing plant knowledge. It was said that she had an intense interest in all growing things, the capacity for hard work, and a keen sense of humour that endeared her to the customers in the village. Miss Castle, as a member of the Meadowvale Women's Institute, was instrumental in starting up the first library in Meadowvale in 1929 and she became the first Librarian. In 1937, she served as the president of the Streetsville Anglican Church Chancel Group. On August 7, 1941, she purchased a piece of property from Miss Blacklock and had a one and a half storey three room frame house built on the same laneway and was given the right-of-way to get out to Derry Road. She was a founding member of the Credit Valley Conservation Authority in 1954 and was also very active with the Toronto Garden Club for many years. Miss Blacklock passed away in 1956 at her home in her 96th year. Upon Miss Blacklock's death, Minerva Castle became partners in Rowancroft Gardens with Miss Ethel Winter. Their business flourished. Miss Castles favourite peony was Grace Adams, named for one of the Garden's workers. It was a large white bloom with golden stamens in its center. Miss Castle became known and respected across Canada for the supreme stock and as being one of the countries best plants-men. She was an accomplished grower of peonies and perennials. Her peonies were shipped as far as Australia. In the 1960's a Rowancroft catalogue offered seventy peonies for sale. Most of the peonies were available for $1 or $2 per plant. Eight of those listed were cultivars hybridized by Miss Blacklock and two by Mr Brown who had a peony nursery in Elora, ON. strong growth and habit. It blooms when all other peonies have faded - very late. Blacklock cultivars were not officially registered with APS. 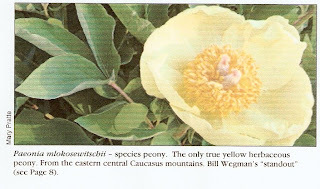 Most of them do appear in Peony Check Lists compiled by Mr. and Mrs. Byron Gist in 1956 and published in the APS application, History of the Peonies and their Originators, 1976. In that publication , it notes that a list of Miss Blacklock's peonies appear in APS Bulletin 93. Dates suggest that her peonies were bred before 1935. Unfortunately, two of the Blacklock cultivars have names that are duplicates of other peony cultivars. The name Chalice was also used by A.P. Saunders and the name Polly Prim by Mr. Auten. Details can be found in the APS History lists. There is a connection to the Dominion Experimental Farm in Ottawa. The cultivar W.T. Macoun is named after the man who hired Isobella Preston to work on ornamental horticulture at the Farm. Miss Blacklock probably new the people at the Farm. Miss Preston's lilies are included in the catalogue. In 1936, the APS Annual Show was held in Toronto. 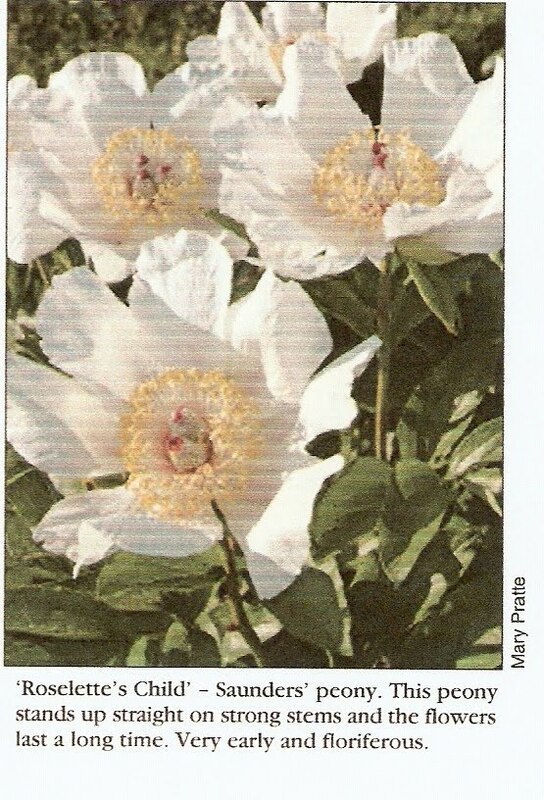 There is a brief reference to one group of show winners on page 39 of the APS publication, American Peony Society, 75 Years. Miss Blacklock took third place in the category requiring 100 stems with at least 80 named varieties! She was the top Canadian. The Rowancroft collection of peonies were from Hybridizers such as Dessert, Crousse, Calot, Kelway & Lemoine as well as Brand from the US and Kelway from England. The collection was very old and reflects the fact the nursery was in its prime before WWII. Most of these cultivars were introduced by 1925 and there is no evidence of the many hybrids introduced during the Great Depression. Miss Castle passed away January 1, 1976 at age 84. The service was held at the Streetsville Trinity Anglican Church on Monday January 5 with services conducted by Reverend David Busby, Rev. David Adams and Lay Reader, Sam McCallion. She was buried at Mount Pleasant Cemetary in Toronto. On Friday October 21, 1977, over 100 people gathered to pay tribute to Minerva Castle at the Meadowvale Community Hall. Organized by the Women's Institute, of which she was a devoted member since 1910. Councillors Hazel McCallion and Larry Taylor, Chief Librarian Noel Ryan and Rev. David Busby assembled for the unveiling of a plaque that would be hung in the Community Hall. Unveiled by a relative, John Beck. It read "To commemorate the Generosity of Minerva S. Castle to the Village of Meadowvale, 1891-1976." Before Miss Castle passed away her property was sold to Frank Baldesarra, who lived in the village of Meadowvale. He has quite a history with the property, where he has built himself a spectacular two storey red brick mansion. He tore down her house in 2002, and rents the elegant Blacklock house at 1160 Derry Road. When I received this request to do a peony profile from Lindsay D'Aoust in mid December, I thought of the rigors of our varying Canadian peony climates, (Winnipeg, going from +5 C to -23 C in a 24 hour day) and thought of these garden stalwarts. These classic garden peonies such as 'Festiva Maxima' (introduced in 1851); 'M. Jules Elie' (1888); 'Sarah Bernhardt' (1906) and 'Karl Rosenfield' (1908) are older selections that remain popular and inexpensive. And how they keep performing throughout this great country. Incidentally the Ferncliff Gardens 1927 catalogue lists 'Festiva Maxima' @ $2.00! Most gardeners have fond childhood memories of these peonies in the gardens of family and neghbours. Thinking of time or years passed, my other thought was how our nursery, Ferncliff Gardens is now in its 85th year. Ferncliff is quite literally where I grew up with the family business. Now at age 56, and the third generation, the grandson of the founder, Milton Jack, I continue to grow peonies in the same location and live in the original family home. In 1980 the peony 'Milton Jack' was introduced to mark the 60th anniversary of Ferncliff Gardens. Milton Jack , my grandfather founded Ferncliff Gardens in 1920. Born in 1877, in Chateauguay, Quebec, Mr. Jack was educated at McGill University. Owing to ill health, after 15 years in the Presbyterian Mission Services in Formosa and Korea, he returned to Canada. There he found the beautiful location in the Fraser Valley where he built up the farm Ferncliff drawing on his boyhood association with horticulture and flowers. For several decades his gladiolus hybrids were some of the best. 'Milton Jack' is a double type, eye-catching deep rose red peony that stands out in the field. A very floriferous variety, blooming early mid-season. The petal texture is excellent, and flowers stand up well to sun and rains. The stems are strong and hold the blooms well. The colour combines well with pink varieties. Reliable bloom, healthy foliage and a refined growth habit make 'Milton Jack' a plant that can be counted on to provide an excellent performance through the years. This peony stands up and stands out. The Oshawa Valley Botanical Gardens is made up of several linked specialty gardens. The Peony Garden is the first OVBG Specialty Garden to be completed. Located at 155 Arena Street, it is conveniently situated in close proximity to both Parkwood Estate and the Oshawa Creek trail. Included in the peony garden is an interesting collection of peonies donated from the estate of Wally Gilbert. 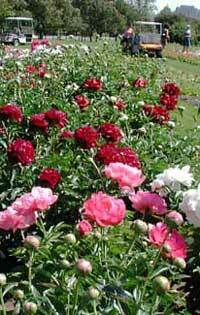 Gilbert took over the nursery of a 19th century peony breeder named William Brown. Gilbert sold peonies at the nursery until the mid-1980s. He retained a large peony collection until his death. Wishing to preserve his peony collection, Gilbert's friends and family approached the Canadian Peony Society to assist them in finding a permanent home for his collection. The peonies were moved to a farm just north-east of Oshawa where their identification was verified. 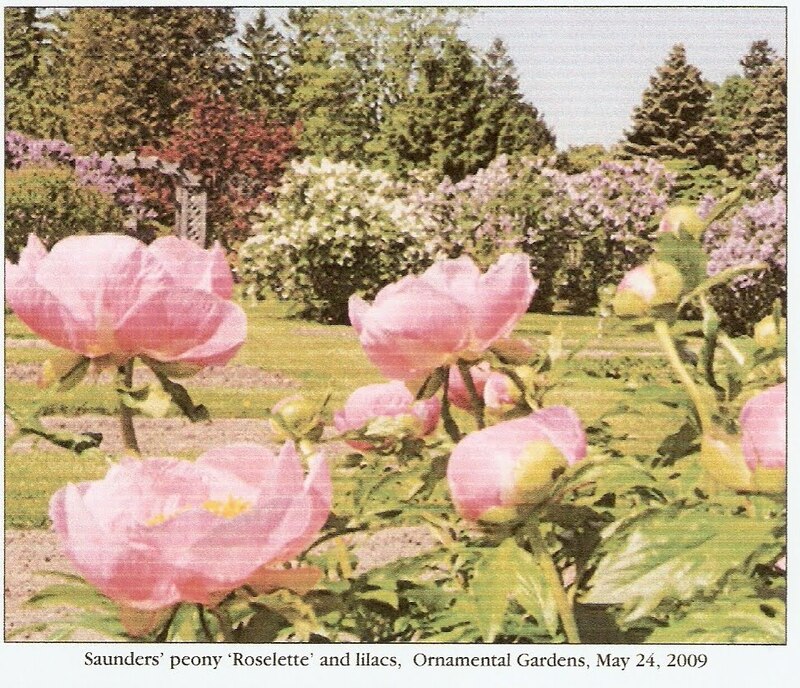 In 2001, volunteers from the Oshawa Garden Club, the Canadian Peony Society and the staff of the Oshawa Parks Department moved one hundred peonies to their new home, the Oshawa Valley Botanical Gardens. Included in the collection are some of the cultivars bred by William Brown and one named for Wally Gilbert's wife, 'Irene May Gilbert'. The Peony Festival showcases the Gilbert Peony Collection. Wally Gilbert acquired a nursery from a 19th century peony breeder named William Brown. Gilbert then sold peonies at the nursery until the mid-1980s and retained a large peony collection until his death. With their identification verified, 100 peonies were moved to their new home in the Oshawa Valley Botanical Gardens by volunteers from the Oshawa Garden Club, the Canadian Peony Society and the staff of the Oshawa Parks Department. Included in the collection are some of the cultivars originally bred by William Brown. The Canadian Peony Society (CPS) has been an active participant in the development of the Peony Garden, donating one-third of the peonies. The CPS also selected the remaining peonies, which were purchased from peony nurseries. About forty percent of the collection contains hybrid varieties, mostly from well known hybridizers including, Auten, Bigger, Brand, Glasscock, Hollingsworth, Kelsey, Klehm, Krekler, Reath, Sass, Saunders and Wissing. 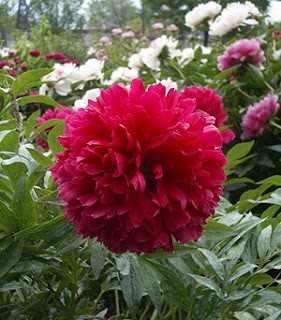 Many of these peonies are not widely known and are hard to find varieties. The Peony Garden is located at the Oshawa Valley Botanical Gardens on the south side of Adelaide Ave. West between Kaiser Crescent and Arena Street, next to the serene beauty of the Oshawa Creek in Oshawa, Ontario. To create a unified feel between each garden in the series, signature architectural elements have been adopted. Adding distinction to the gardens, two stunning new features were added in 2006: an ornamental gazebo and a new pedestrian footbridge. Rotary Bridge, which was opened in celebration of the 100th anniversary of Rotary International in 2006, was commissioned by the City of Oshawa for the enjoyment of all visitors and citizens. 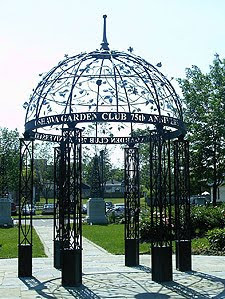 The stunning gazebo commemorates the 75th anniversary of the Oshawa Garden Club and creates a delightful focal point in the Peony Garden entrance. Corporations or community groups celebrating major milestones are invited to sponsor future additions to the Oshawa Valley Botanical Gardens. To learn about upcoming naming opportunities, contact us. The gardens are stunning throughout the summer, with each week revealing a new treasure to be enjoyed. Photographs and plans of new garden developments will be posted on this website as they are confirmed, so visit both the gardens and this website frequently to stay up-to-date!